Summer has come and gone. Sunday’s suddenly went from showing off your bikini bod, to chowing down in front of the flat screen watching football. Whether you are supporting your hubby or are a die-hard fan yourself, typical menu items went from salads and super skinny cocktails to pizza, nachos, and beer. MetLife Stadium offers up their Signature Sloppy Joe: a bacon Sloppy Joe piled high with shredded pepper jack cheese and fried onions, served with a side of corn chips– An estimated 1,265 calories, 74g fat, 1,261 mg sodium. If you don’t switch up your strategy soon, you will end up packing on an extra ten to fifteen pounds of unwanted padding. This season BN has paired up with NYC’s most talented nutritional icons to give you our version of the most common football foods. Paolo Mascitti, celebrity trainer and founder of meal delivery system Cibo Verde, has a savory tailgate recipe that is not only tasty, but healthy! Pizza is a classic game day go-to and now it can be guilt-free! Place the gluten-free tortilla on a baking sheet and add marinara sauce making sure to spread evenly on crust. 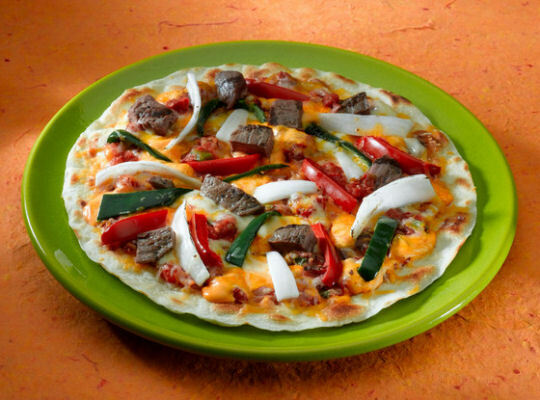 Follow with cheese, onions, peppers and steak. Place in oven for five minutes, allowing cheese to melt. The entire process will take no more than 10 minutes and you’re ready to eat! 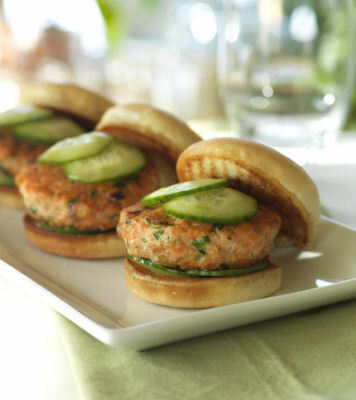 Introducing Mini Thai Salmon Sliders featured in the new cookbook, The Truly Healthy Family Cookbook. These are truly a great alternative to beef sliders. This version is only 180 calories per slider. Just one of these sliders delivers nearly 600 mg EPA and DHA (good for your brain), along with 120 percent of a day’s worth of vitamin A. Place the salmon, coriander and red curry paste in the bowl of a food processor fitted with a steel blade. Pulse until well-combined then add the cilantro, scallions and 2 Tbsp. of the fish sauce. Pulse to incorporate. Form the mixture into12 sliders, approximately 2 ½” in diameter. Sliders can be frozen at this point. Remove to the refrigerator to defrost before proceeding. Toss the cucumber with the rice vinegar and remaining 1 ½ tsp. fish sauce. Reserve. Heat oven to 200ºF. Heat a non-stick skillet over medium heat. Brush with a little of the vegetable oil. Place as many of the sliders in the oven as will fit in the pan. Cook until browned on one side, about 2 minutes, then repeat on the second side. Cook all sliders. Place them on a baking tray in the oven. Toast burger buns or rolls, if desired. Place bottoms on a work surface and top with the cucumbers. Top each with a slider. Drizzle the juices from the cucumber on the top half of each bun before closing. Rather than snacking on chips and dip or ordering nachos and cheese, why not try an oldie but goodie in a variety of flavors—pistachios. Surprisingly, researchers from the Psychological Science Journal took a look at what happens to sports fans the day after a big game, and found that supporters of the winning team tended to eat healthier foods. 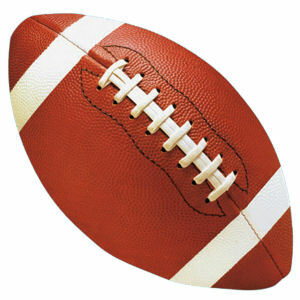 Fans of the losing team however, appeared to eat more saturated fats and sugars—almost 9% more! 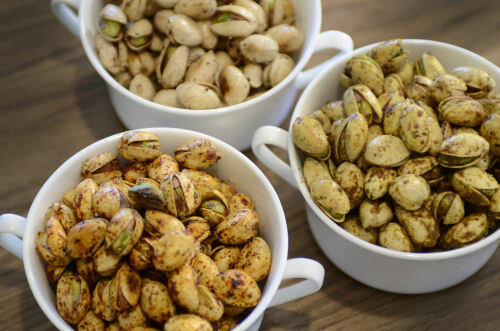 Pistachios, compared to other nuts, are not nearly as caloric, and each pistachio is chock full of necessary nutrients to keep you going from kickoff to the final seconds. The stats speak for themselves: 160 calories of pistachios (or 49 nuts) contain 6 grams of protein. In comparison, 15 tortilla chips contain only 2 grams of protein! Yield: 1 pound snacking nuts. Warm the canola oil in the pan or wok on your stove top, add the pistachios and lightly toast. Add the teriyaki sauce and Dijon mustard, coating the pistachios evenly; season with sea salt to taste. Remove from heat; serve hot in the vessel of your choice. This tasty treat is not only filling, but so versatile. Pair with anything from veggies to baked tortilla chips and you’ll have a crowd pleaser in seconds. With only 44 calories per serving, this deliciously cream dip won’t throw any red flags on the play. Beat cream cheese in a mixing bowl with electric beaters. Beat in yogurt until smooth. Peel, seed and mash avocados with a fork in a small bowl. Add to yogurt mixture along with salsa and lemon juice. So the next time you reach for that big bowl, think of the amount of calories you could be eliminating by following just a few of these simple recipes.